The human rights activist represented the interests of Lutsenko in the ECHR. 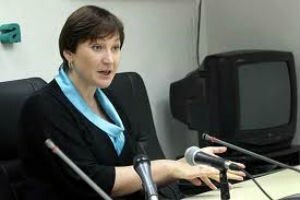 Prosecutor General Yuriy Lutsenko is set to appoint human rights activist Valentyna Telichenko his deputy on reforms, the press attache of the Embassy of Georgia in Ukraine in 2005-2010 Bacho Korchilava told the TV channel 112Ukraine after a meeting with Lutsenko. "Valentyna Telichenko will be his deputy on reforms There were many other names mentioned, but I will not talk about them. Some of the deputies will retain jobs, though with their power curtailed. Others, who have enraged the society, are in for axe," Korchilava said. Earlier, MP Mustafa Nayyem, said after a meeting with Lutsenko that the new chief prosecutor will dismiss three of his six deputies. Valentyna Telichenko, 47, is a Ukrainian human rights activist. She specializes in criminal and civil law, and led cases in the European Court of Human Rights. A member of the board in the International Renaissance Foundation. Telichenko represented the interests of Lutsenko in the European Court of Human Rights. The court found the detention of Lutsenko as illegal, and dismissed the case as politically motivated. In the ECHR, she also has represented the interests of Myroslava Gongadze, Nadiya Savchenko, Yulia Tymoshenko and Valeriy Ivashchenko, and the victims of the May 2, 2014 clashes in Odesa.